Members of the public will be able to parachute from an altitude of 7,700 metres for the first time ever in France, this September - nearly double the usual height, and including a free fall of two minutes. On September 18, 19 and 20, parachuting company the Vendée Evasion Parachutisme (Pays de la Loire) will offer eligible participants the chance to jump from this unprecedented altitude. Normal parachute jumps take place from around 4,000 metres. Jumps from 7,700 have never been offered publicly in France. At this altitude, parachutists must wear breathing equipment while travelling in the plane before the jump, and during the jump itself. It will take 45 minutes in the plane to reach the required altitude. All passengers will receive a specific briefing ahead of the plane ride and jump, and must be in good physical condition. 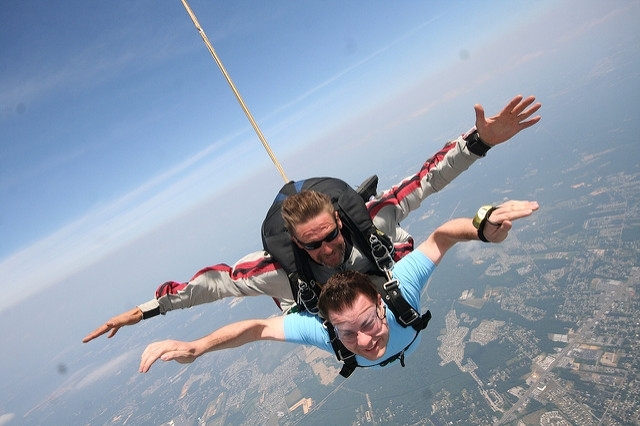 Tandem jumps - in which the participant jumps while attached to an experienced instructor - will require a mandatory doctor’s certificate, and cost €970 per person. Anyone wanting to do the jump solo will need to be in possession of a current BPA certificate (le Brevet de Parachutiste Autonome) proving their ability to jump alone, plus proof of 200 previous jumps. Solo jumps will cost €270 each. As well as the exhilaration of the jump itself, the experience also promises unparallelled views of the Vendée region and the Sables d’Olonne bay. These extraordinary jump sessions have been coordinated in partnership with Paul-Henry de Baère, an extreme skydiver. Mr de Baère has organised very high-altitude jumps, including above the world’s tallest mountain, Everest (8,848m), in Nepal (above). He is also the inventor of Top Out Aero, the breathing equipment used during high-altitude jumps. Vendée Evasion is hoping that the jumps will bring more awareness of the sport, and raise its reputation in the Vendée and across France nationally.